Usually, the last three episodes of each Mad Men season provide the viewer with a nice, neat (as neat for Mad Men’s scope as is possible) triptych of drama on which to wave the season goodbye. In Season 2, you had Don’s trip to California in the “Jet Set” and “The Mountain King,” followed by the dramatic conclusion of “Meditations in an Emergency.” The drama in those episodes coming from Don’s absence in the office and the pending sale of Sterling Cooper to Putnam Powell and Lowe, which was Duck’s attempt at a coup against Don. 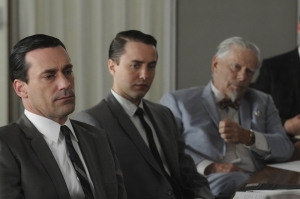 In Season 3, you had “The Gypsy and the Hobo,” where Betty confronted Don and Don had to dump Ms. Farrell; “The Grown Ups,” where the show confronted the Kennedy assassination and Betty told Don she didn’t love him anymore; and of course there was the thrilling “Shut the Door, Have a Seat,” where Sterling, Cooper, Draper Pryce was formed. Perhaps in hindsight the triptych of this season will make itself evident, but at the current moment, there is not a total feeling of “neatness,” that is to use the term in the Mad Men sense, which is a feeling of the season coming to an end, a pressure of drama that eventually must manifest itself in some surprise in the season finale. That seems to be the description of how most shows work, but Mad Men is especially so, given how many characters and storylines are intertwined and brought to some kind of climax or revelation in their lives at each season’s end. At the moment, though, there is no sense of neatness to the final trilogy of episodes and maybe that is because we are still waiting for the season finale, which promises to be as pressure filled as any season finale so far in the series. “Blowing Smoke,” to me, was as understated an episode as you will get in Mad Men. The themes were all there and they all felt like they were intricately connected, but you weren’t quite sure how to connect them in each instance; the themes being “changing the conversation” or changing your identity, determining worth, and the border of want vs. desperation/addiction. Since all the themes in the episode seemed to simmer, this allowed the main action of “Blowing Smoke” to draw the attention it deserved – that action being the ad that Don took out in the New York Times. What led Don to taking out the ad was a variety of things: failure at his meeting with Heinz and his subsequent desperation to get the account (“I could get a date with your mother right now if I wanted to”), the tease of the Phillip Morris account, the lack of effort exhibited by Pete, Ken and Roger and last but not least, Don’s encounter with Midge. As soon as I saw Rosemarie Dewitt’s (slightly in love with her, wait until Wednesday’s Top Ten Women of Mad Men column) name on the opening credits, I was curious to see how they would use the character of Midge in the current landscape of the show. Not only does Midge and her initial conversation with Don in the lobby echo the first season of the show (notably the pilot episode, titled “Smoke Gets in Your Eyes’), but it also echoes Don’s initial meeting with Roger Sterling in the lobby of the old building. However, in this case, Don and Midge have an actual history and Don reveals that he was perhaps in some ways hoping to see Midge when he decided to move to the Village. Don’s affair with Midge set the tone for the Draper affair that “works.” He respected Midge in some intellectual way and respected the identity that she had created for herself. “The Hobo Code” was a perfect example of how Don could have easily fit into the bohemian culture, a culture that is in many ways a variation of the hobo culture that Don has grown and created himself out of. Here, though we see how far Midge has fallen and how desperate she is for a little bit of money. Don gives her a check for $300.00, but she needs the cash in order to get her fix. However, her desperation gives Don an “afterimage” that he can see himself in, as well as his situation. Don and the rest of the firm have been desperately seeking new clients, client’s that don’t even care about them because they have no worth at the current moment. He has to “change the conversation,” as Peggy reminds him of advice he once gave her. 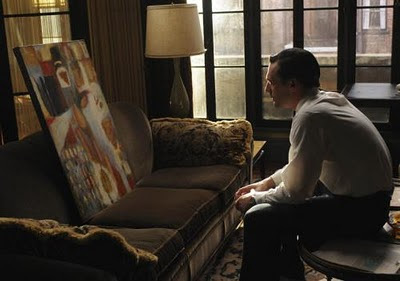 So, instead of throwing the painting out, Don looks at it and decides how to change his value and the value of the firm. He writes a letter and places it in the New York Times as an ad for SCDP. All of the partners are upset, which was somewhat jarring at first view as you would like to think that some of them (especially Pete after this season and perhaps Lane) would understand the forward thinking. Unfortunately, it causes Bert Cooper to quit the firm, while Roger is pleased everyone can no longer blame him. Interestingly enough, it is Megan who understands what Don was trying to do as she says, “its about ‘he didn’t dump me, I dumped him’.” And that is what Don was trying to do in yet another example of how he tries to rewrite identity. In this case, it was the firm as an extension of his identity. We never want to be on the losing end of a relationship, so we sometimes construct ways in order to make it seem that we were not the one who was dumped, we were really the ones with the upper hand and even if we are dumped, then it was for some cosmic and mysterious reason, something that makes us interesting and appealing for whomever comes next. You change the conversation in order to divert attention so no one realizes that you have taken the upper hand. Now, we don’t know if Don has really taken the upper hand, but he took a risk and perhaps that risk will get him noticed as we come to the final episode. The firm needs a big client. They can’t stitch together a few accounts. Some people are guessing that it will be Conrad Hilton returning, while some are guessing by the title of the final episode, “Tomorrowland,” that it may be Disney who comes calling for Don’s service. In the other storyline, Betty and Sally clash again. And while Sally speaks with her therapist, we see that she is literally using the technique of changing the conversation to get the upper hand on her mother. “She doesn’t care what the truth is,” Sally says, “as long as I do what she says.” Instead of fighting Betty about what really happened, Sally as learned the art of changing the conversation, of biting your tongue in order to fight another battle. Unfortunately, we see that Betty is just as apt at this as Sally is. When the therapist tells Betty that she should be seeing a doctor who can treat adults, Betty changes the conversation back to Sally in order to emphasize that it is important that she still goes to see Dr. Edna. And, later in the episode, after Betty has caught Sally spending time with Glen, she decides to change the conversation from that incident to moving out of Don’s home. This crushes Sally and we see a very lonely shot of her laying in her bed in the evening sun of September holding the lanyard that Glen made for her. All I could think of when watching this scene was Sally explaining that the idea of “forever” makes her upset to think about. This idea of a child understanding forever, of using some experience of image (the butter label) to convey a vast concept is terribly moving to me. Those are small experiences that you remember from childhood, for the universe has opened up for one small moment to your child’s mind and you begin to understand a size of things far greater than what you normally are able to comprehend. The other subplot that interested me, was Faye having to leave SCDP as a consultant due to Dr. Atherton wanting to do business with tobacco companies and the firms that represent them. Now, as Faye makes it clear, she and Don can have a relationship that is out in the open. It’s hard to read how Don feels about this. Faye took a risk for him to get the Heinz account. That risk didn’t work out due to extenuating circumstances, but it showed her devotion. She wants to be with Don, but it is unclear if Don is ready for that, no matter how much he is trying to improve or wants to improve. Faye is a good match for him. She is a strong, smart woman. But perhaps that’s not what Don wants. But does he want Megan? No matter how much she empathizes with him in the aftermath of their intimacy both sexually and philosophically in “Chinese Wall,” you still never get the feeling that she’s exactly what Don wants either – that is something that Roger would do. There were plenty more terrific small moments in this episode and now, replaying all the themes and action of the episode perhaps the classic Mad Men end of season triptych may be in tact. All that’s left is that last piece next Sunday, which will perhaps change everything, for now, once more for all these characters.